A. Warning : Make sure your SD Card is above 1GB. 2. Insert SD Card and press R Button and turn on your device for upgrade. 3. Release the R Button when Firmware upgrade screen appears. 4. It takes 15 min for upgrade. 5. If firmware has been properly updated then reboot it. Set value of touch panel is initialized by the update therefore revise the setting value of touch panel in environment setting. 6. If you see following message, try it again by switching off and on. If you still have the same problem then try it again by replacing SD card..
7. If all completed, delete those files copied to SD memory. ※ If battery discharges during upgrading firmware, it may cause damage to product. Therefore battery must be fully charged or secure stable electric power using USB cable before start to upgrade firmware. ※ Some pictures on the screen may be broken during patching firmware. It will output normally after completion of patching. Upgraded just now, everything went smoothly. Used a 2 GB SD with 1,59 free. Took about 12 minutes. At a quick glance, touchscreen performance seems to be significantly updated. Why is the official site still showing 1.2.1 as the latest, is this an official firmware? This is the latest firmware on fungp.com (GPH's New website), this is an official firmware. So, SDHCs seem to be the problem, right? Everyone using non-HC 1-2 Gb cards seem to do just fine. My 4GB SDHC car worked fine. Except when the load bar was full, it was stuck for a few minutes before it said "Firmware Upgrade Complete!". @Animan, that's normal. 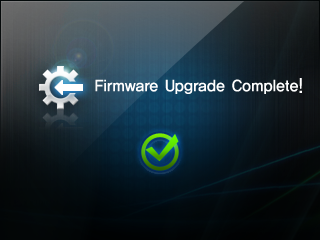 It's done that for me for the last 2 firmware updates. Wont upgrade tried zip, so extracted to sd held r and nothing?? also put in game folder??? Ahhhaa, all files are not to be in folder!!! Yep! sorry, I would have told you that if I noticed your post earlier. There aught to be more clear instructions than "Copy Paste the firmware file into your SD Card" - that's misleading. the .zip will do nothing unless extracted, and the firmware will not update if it's inside another folder. people with the right wifi adapter(s) generally use Opera built into Qtopia. A native Wiz standalone browser would be nice though! Ok, this device is quite annoying. I tried everything in the directions above, including the posts, and still no upgrade. Tried with 16G, 8G, and 2G cards. Still nothing. Suggestions?? @Darmakwolf, yeah standalone browser would be nice but also more stable version of Opera because it's very unstable. It can't handle images nearly at all. It just crashes. cottonvbc, it's not an "annoying device" - it will upgrade the firmware if you set it up right. 1: download the .zip, extract it to the desktop. 2: put everything from inside the folder you just extracted onto the root of the SD card. (Make sure the card is clean and formatted for best results.) 3: Put the card in the Wiz, power it on while holding the R trigger. (Hold R, press power while still holding it, do not release until you see "Firmware Upgrade." 4: Wait until it's complete, then reboot. @Darmakwolf, thanks a bunch! I followed your instructions (the instructions that should be included with the software) and it upgraded fine. It's still a bit annoying since it seems the only way to learn everything about the wiz is to read forum posts and watch youtube videos. Oh well, at least I'm making progress. Thanks again. I recently tried to update to this latest firmware. After 30 mins or so I thought it had crashed so turned the Wiz off and turned it back on again and now the screen is blank/black. I have tried to re-install the firmware but the system doesn't seem to be responding. I was using a 32GB SD Card and tried a 4GB card to see if that would work but unfortunately still no response. Any help would be much appreciated. @ByJove: oh dear... ... you may have bricked your Wiz system. I wouldn't have recommended firmware upgrading off a 32GB card to start with, and turning it off before "firmware complete" was a bad idea. I've heard of people waiting 6-7 hours before it finally said complete. Was your Wiz charging while you upgraded the firmware? - at any rate, remove the battery and wait a while, then set up your 4GB sd card for a firmware upgrade, insert it and try again. Let me know how that goes. Hi Darmakwolf, I think I have. It was charging during the upgrade and I tried removing the battery. I've ordered a Caanoo instead so hopefully I will have better luck with that. Thanks for your help. Flash was also successful in under 6 mins using a 4GB SDHC. The one thing I did notice in the settings is there is a WIFI tab in there. I'm sure someone can explain if this is in conjunction with the WIFI dongle mod? An easy update using a Sandisk 4GB SDHC. Took about 10 minutes. Thanks infestdead! I just used a sandisk 16gb sdhc. Tried a few times then read on here I'd have better luck formatting it first...Now it seems to be working fine. I first couldn't figure out how to install this but then after reading infestdead's instructions I was able to upgrade it, so THX infestdead!